This overall winning photo shows a green aurora above a glacial lagoon in Iceland. A bright green aurora reflects off a glacial lake against the backdrop of a snow-covered mountain range in an incredible photo that took home first prize in an astrophotography competition. Representatives of the Royal Observatory in Greenwich, England, have awarded James Woodend — the photographer behind the stunning aurora image — the overall prize in the observatory's Astronomy Photographer of the Year contest for 2014. The winners of the contest (which is in its sixth year) were announced today (Sept. 18). 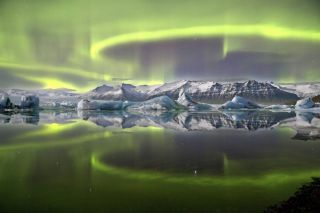 The British photographer captured his winning photo in Iceland's Vatnajökull National Park, with the glacial Jökulsarlon lagoon in the foreground. The winner in the "Our Solar System" section of the competition, this image shows the sun's activity in a stunning close-up. Sept. 18, 2014. Woodend won 1,500 pounds (about $2,458) in prize money for his entry, and his image also took home first prize in the "Earth and Space" competition category. "I love the combination of whites and blue in the glacier with the chilly green of the aurora in this wonderfully icy picture," competition judge and Royal Observatory Public Astronomer Marek Kukula said of the image in a statement. "We've had some amazing aurora pictures in the competition over the last six years, but this is the first time a photo of the northern lights has actually won the Astronomy Photographer of the Year prize. We were all completely in awe of the colors and symmetry of James' shot." The Horsehead Nebula shines in this stunning view of the star-forming region taken from the United States. Sept. 18, 2014. Other photographers from around the world also took home competition prizes in different astrophotography categories. Alexandra Hart's close-up photo of the sun shows the boiling hot activity of the star and took home top prize in the "Our Solar System" section of the contest. The overall winner in the "Deep Space" category went to Bill Snyder of the United States for his breathtaking image of the Horsehead Nebula shining in blue, red and pink. The winning "Young Astronomy Photographer" prize goes to 15-year-old twins Shishir and Shashank Dholakia for their image of the Horsehead Nebula. "This year, two things stood out for me while judging: The record-breaking number of 2,500 entries from a truly global community of astrophotographers, and the staggering quality of the images. It was regularly hard to believe that many were taken from the surface of the Earth and not a space telescope orbiting our planet," BBC Sky at Night Magazine's Editor and competition judge Chris Bramley said in the same a statement. Another photo of the Horsehead Nebula took home the prize in the "Young Astronomy Photographer" category. Sept. 18, 2014. Interested space fans in England can see an exhibition of the winning images from now until February 2015 at the Royal Observatory's Astronomy Centre. The winners and finalists will be published in a book, which can be purchased in bookstores or online from the Royal Observatory.